Title: Q515-06 plows through the snow with 2 brand new ES44AC's!! Description: New CSX 740 on Q121 heading south on the Jesup sub towards Florida. 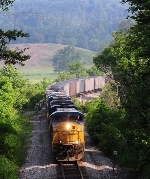 Description: CSX K-311-14 waits for a signal just about a mile or 2 west of Hickville Ohio on the Garrett Sub. Description: with a load of coal for the Dominion Power Plant. Description: CSX southbound heads towards NS overpass near Oak Ridge, TN. Description: Southbound coal train, approaching Reynolds Street, S 823.02, on the Yeoman Subdivision. Madisonville, KY to the TECO Big Bend Power Station on the Palmetto Subdivision. Description: Southbound coal train, crossing Reynolds Street, S 823.02, on the Yeoman Subdivision. Madisonville, KY to the TECO Big Bend Power Station on the Palmetto Subdivision. Description: CSXT 740 splits the signals at CC 108.5 as it approaches North Stoney Creek Road with southbound Q15125.